At Go Live HQ, when we create custom websites for our clients that have imagery that perfectly pairs with their brand, that's when you really get to see the brand as a whole pop. Imagery that is specific to your brand can make a world of difference for you on the web. In talking with our clients and customers, how to find photos, how to take photos, and how to plan for photos can be a really daunting task when prepping for your brand. For our own brand, we have monthly photoshoots planned that center around our upcoming blog posts, resources and new products. We've found that it has made a huge impact for us not only on our website but also in using those photos for our blog posts and social media as well. Strong imagery is an absolute critical piece to building your online visual identity. Unfortunately, some brands and businesses haven't been able to see the value of professional photos quite yet. We see them using low-quality photos on their website, on social media and in their marketing materials. Or, even worse, they are using no photos at all. Here's the thing - having low-quality photos that don't match your brand (or having no photos at all) can really cheapen your brand's image when people find you on the internet. In the world of web, even if you are the absolute best of the best in your field or profession, if you don't LOOK credible on the web, people won't trust you and won't book you or buy from you. It’s easy for business owners to simply use stock or royalty free photos, but having a photo shoot entirely for your business is far more beneficial. You have an even stronger visual brand presence because your photos are curated to match your brand. Your brand image is more consistent across the board, which creates more trust with your clients or customers. You can use the photos in more and more ways because you can negotiate having the rights to the photos with your photographer. 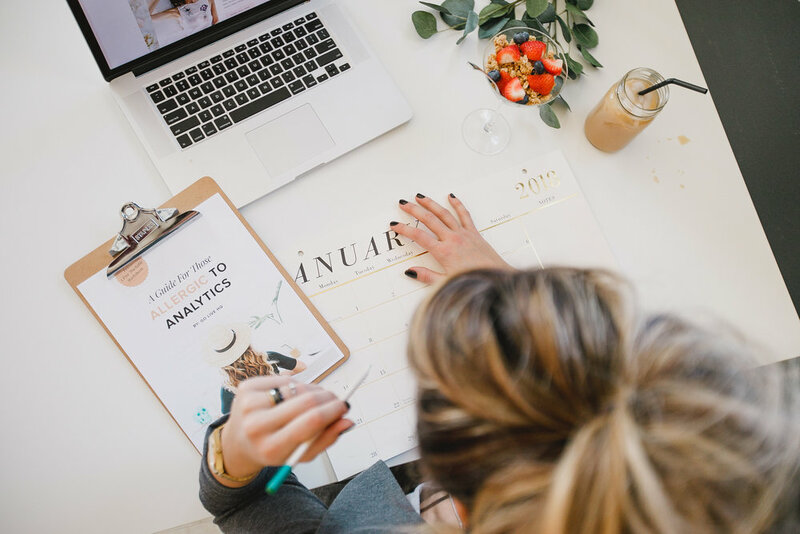 You can create visuals for specific products, campaigns, courses, launches or even blog posts during a photoshoot so that everything from your homepage to your helpful blog pots are on brand. We have a budget for photography at Go Live HQ! Even if you're just starting out, prioritizing even a small amount to get a few photos taken can make a huge impact for your brand identity. Find a photographer whose photos and editing style match or coincide with your brand or business. If you are a light and fun brand, you won't want to pick a dark and moody photographer. If your brand is professional and sleek, you don't want to pick a photographer that has a quirky and eccentric style. Do a little Googling to find a couple of photographers that will fit your brand. PRO TIP: Need help identifying photos that might fit your brand or business? We've got a great blog post on How To Choose Photos For Your Brand. Create a shot list, or a list of all the photos you need to take. Be as specific as you can for this! Think about basic needs you have for your website. Do you need photos of you? Photos of doing what you do daily "in the office" or wherever it is that you work? Think about your upcoming products, courses or offerings. How can you capture that in a visual? Do you have blog posts coming up on your calendar that you need photos for? List all of those things! Need help with this list? Start by thinking about your daily activities in your business and list those! Below is an example of photos we got at a recent photoshoot and the list item that photo was on our shot list. Reach out to the photographer(s) you found to start the collaboration! If this is something that might be out of their wheelhouse (example: if they are a portrait photographer or a wedding photographer that you found), make sure that this project is within the scope of what they do, or find out if they are willing to step outside of their normal scope. Make sure to talk about expectations for how you'll use the photos right off the bat as well! Let them know they are for your website, for marketing materials, etc. Photographers need to know this so that they can outline how you use the photos in any copyright contracts they have. PRO TIP: Let your photographer know that you are willing to tag them in photos on social media or even give them photography credit with a link to their site at the bottom of your website. A little bit goes a long way in a working relationship! We know that it sounds crazy, but always be planning! If it's in your budget to do another shoot next year, next month or even 4 times a year, start planning your shot list and see if you can set up a working relationship with a photographer. If you've found a photographer you love, then working with them can get easier and easier as they understand and know you and your brand better. PRO TIP: Knowing what blog posts you have coming up is an amazing way to streamline your priorities and make your whole life easier. You can use our FREE Content Strategy Planner to plan out blog and social media posts ahead of time.